What Sort of Paper Do I Need? Dot matrix – Needs an inked ribbon to print images. This type of printer uses plain paper rolls – either bond (1-ply) or carbonless (2- or 3-ply), depending upon your requirements. *Hint: If you are unsure of the type of paper that you need, scratch at your existing roll with your fingernail. If it marks clearly, it is thermal paper. Aren't All Paper Rolls The Same? No. Paper rolls vary according to the application that they are being used for, or the type of printer/machine that they are being used in. Paper can be either plain or thermal (see above in What Sort of Paper Do I Need? ), single ply or multi-ply; CSI (thermal coated side in) or CSO (thermal coated side out). Plus diameters, lengths and core sizes will vary. 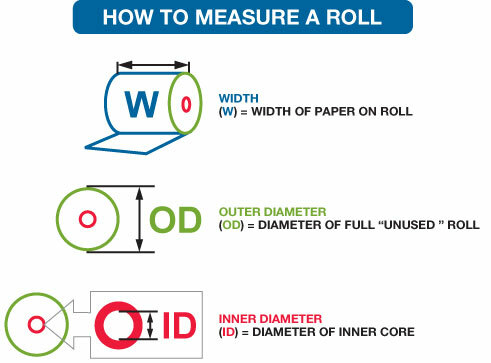 It is important to understand and use the correct type and size of roll for your equipment. Contact us for any help or advice that you may need. Thermal paper is paper that has been pre-coated or impregnated with special chemicals that react with heat at a specific temperature. When the thermal paper passes over the print head in a thermal printer, the areas in direct contact with the print head turn black, producing an image. Our premium quality thermal paper rolls provide an archive ability of 5 to 7 years. Inferior grades of paper will only provide 1 to 2 years maximum durability. Our papers are stringently tested for heat, light and moisture resistance, durability and print quality. Don't risk your image fading. 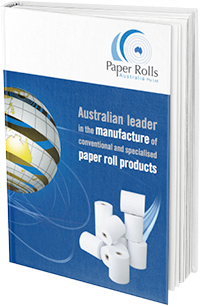 Use only premium quality thermal paper rolls from Paper Rolls Australia. Why Do Inferior Grade Papers Damage My Printer or Equipment? Inferior grade papers can be quite coarse and can act as an abrasive on the thermal print head of your printer. This produces prolific amounts of "paper dust." Paper dust causes abrasion to print heads and is a major contributing factor to the malfunction and damage of printer and POS equipment. Sub-standard thermal paper also tends to have a thinner thermal coating, or contain unexpected foreign chemical residue, forcing print heads to work harder to produce an image. Failure to use approved grade papers can also lead to invalidated warranties on your printing equipment. Cheaper Rolls Will Save Me Money, Right? No. Apart from the problems and damage that using sub-standard grade papers can cause to your printing equipment, cheaper inferior quality paper rolls are often compromised. These come in approximate sizes only. A few metres short on every roll that you purchase add up to a lot of paper that you are paying for and not receiving over time! Our rolls are guaranteed in length for your complete peace of mind. What Sort of Things Can be Printed on My Rolls? Company logos, promotions, advertising, special offers, discount coupons etc can all be printed (front or reverse side) on most types of docket rolls. 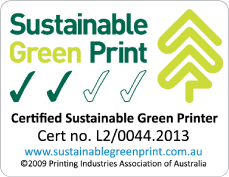 We offer customised printing (front or reverse side) of up to six colours. Can You Help Me With Design for My Printing? Yes, we have access to expert graphic design channels to assist with your printing requirements. Yes. We can print in 'thermochromic' ink or 'UV invisible' ink when added security measures are required. Contact us to discuss your needs. No. No order is too big or too small. We are happy to service your needs, whatever they may be. Yes. We cover the entire eastern seaboard plus northern, central and western Australia. Normal delivery time for stock items is same day for local area (ie: Sydney) for orders placed before 10:00am; or overnight to most locations on the eastern seaboard for orders placed before 1:00pm. Do You Also Stock Printer Ribbons?